Share the post "Oriental Poppy Or Papaver Orientale: Growing Tips"
Papaver orientale or Oriental poppy is a long-lived, herbaceous flowering perennial plant with deep taproots, which grows on mountain meadows and on mountain screes. Oriental poppies are closely related to the great scarlet poppy Papaver bracteatum, which can be grown for the commercial extraction of thebaine, a main source for the legal synthesis of opiates. This species, however, does not produce any narcotic alkaloids such as morphine or codeine. Many garden Oriental poppies are actually hybrids between Papaver bracteatum and Papaver pseudo-orientale. Three thousand years ago, gardeners were growing oriental poppies and their Papaver cousins around the world and ever since oriental poppy flowers are the striking point in the garden when they are in full bloom in late spring to early summer. Their original vibrant red-orange color is still the most popular for growing, but the plant’s huge flowers can be red, salmon, orange, crimson, pink, lavender and white with many variations. In addition petals may be creased or fringed, such as Türkenlouis. Once planted, they require no special care and will last for many years. Cultivars: Barr’s White, Maiden’s Blush, Royal Wedding (white), Black and White (white/black), Brilliant, Beauty of Livermere, Türkenlouis (red), Carnival (white/orange/red), Cedric Morris (pale pink/black), Indian Chief (mahogany red), GI Joe (red double), Watermelon, Helen Elizabeth, Papillon, Patty’s Plum (pink), Khedive (pale salmon/black), Olympia, Leuchtfeuer (orange). Native: to Caucasus, northeastern Turkey, Armenia, Azerbaijan and northern Iran. Soil: Loam, Mildly Acidic, Neutral, Well-Drained. Thrives in light calcareous soil. Hate soggy soil. Time to plant: Spring where the winters are cold and fall where the winters are warm. Plants can be divided in early spring or summer. • From seed: the best is to sow the seeds directly into the ground (as they do not like to be disturbed) after the potential of frost has passed, the average temperature is approximately 21 °C and when soil has thoroughly warmed. The seeds are sown at a depth less than one centimeter as light may stimulate germination. Germination period is 10–20 days. • From seed: sow indoors before last frost in biodegradable pots that will go into the ground along with the plant or winter sow in vented containers, cold frame or unheated greenhouse . Fertilizer: one light application of organic fertilizer in early spring. • After flowering, the stems and leaves can be cut down, and the leaves emerge again in autumn. In fall, when the weather cools, they come back stronger than before. The clumps will become larger each year, but will never be invasive. When plants are dormant in midsummer, watering is needed only during periods of drought. Do not overwater! • Oriental poppies perform poorly in regions with hot summers, and the flowers may need staking to keep from flopping over when in full bloom. • Apply a thin layer of compost each spring, followed by a 2 in (0,8 cm) layer of mulch to retain moisture and control weeds. When soil has frozen, apply a 4 – 5 in (1,6 – 2 cm) layer of mulch to prevent heaving during periods of temperature fluctuation. When the weather warms up in spring, remove the protective winter mulch. • Plant oriental poppies with plants whose growth habits will cover the garden bald spots when poppies go dormant in the heat. • Oriental Poppies do not handle transplanting or over-watering well. 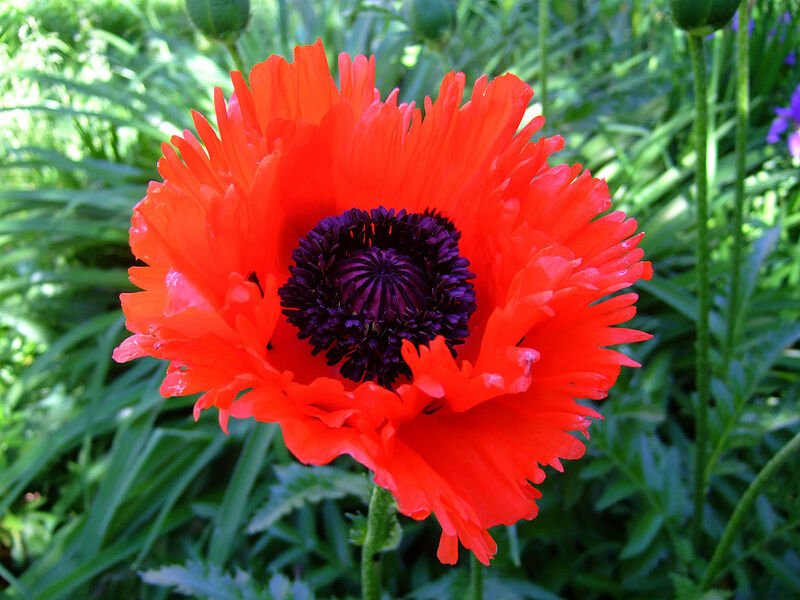 Do you grow Papaver Orientale (Oriental Poppy) in your garden? What is your experience with this plant? Please share with other fellow gardeners in the comments below! Do you sell Papaver Orientale (Oriental Poppy) seeds or have plants for sale? You can place your advertisement here. Contact us now!